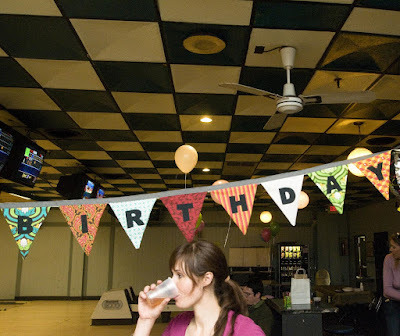 Yes, that's me drinking a beer at my daughter's birthday party. It was delicious. 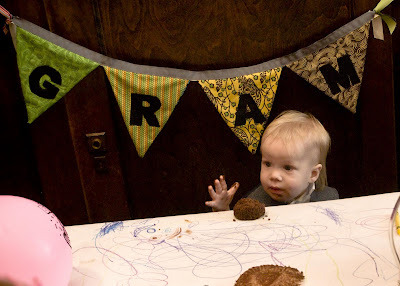 For Gram's party last weekend, I made a smaller banner with his name on it that I hung under the same happy birthday banner. I love how this project came out. It took longer than I anticipated to finish, but the banner is something I'm looking forward to using every year. I'm also considering hanging the kids' names above their beds when we move them into the same room (and hopefully get to redecorate over the oppressive girly-ness that dominates Juniper's room right now). several yards of ribbon (1 inch thick). Also, of course: scissors/rotary cutter, sewing machine, and thread. Optional: you can print out the letters in the font of your choice and stencil them onto the fabric. 1. 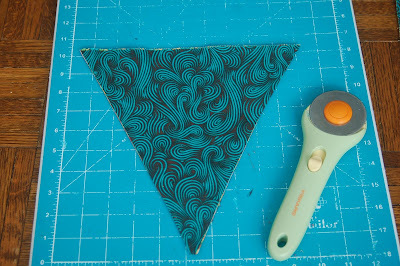 Cut triangles out of your fabric. I had a bunch of 10 inch squares in coordinating fabrics, so I started at the mid-point on the bottom of the square and cut diagonal lines up to the corners. 3. Cut the letter out, and remove the wonder under paper from the letter. 4. Iron the letter, sticky side down, to the triangle you want for the front side of your banner. Put a wet/damp cloth between your fabric and the iron and press for 10 to 15 seconds. Remove the cloth, and press until the moisture is all gone. 5. I sewed a zig-zag stitch around each letter, but you could skip this step. I thought it made the banner look more finished. 6. 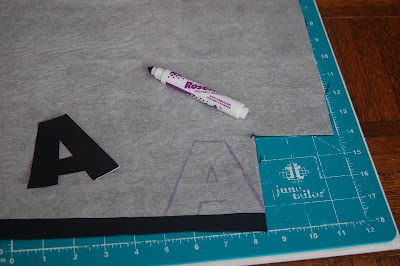 Sew a letter-triangle to a triangle cut from the fabric you want for the backside of the banner. With wrong sides out (right sides in), stitch along the diagonal edges, leaving the top unsewn. 7. Turn the triangle right side out, and iron it flat. 8. Once all the triangles are lettered and sewn together, measure out two equal lengths of ribbon long enough to leave you a few feet of unsewn ribbon at each edge for tying the banner up. I just measured by laying all the letters out and stringing the ribbon along to see how much I'd need. 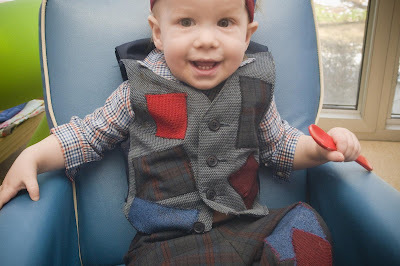 You'll need two lengths of ribbon that you'll sew together. 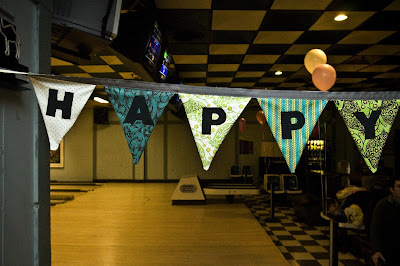 If you don't have enough to leave extra at the edges, you can always tie another length of ribbon to the end (see Gram's banner above). 9. Pin the letters between the lengths of ribbon, making a ribbon-triangle-ribbon sandwich. Carefully place the raw edge of the triangle so that it's completely covered by the ribbons, and trim the triangle if necessary. Then sew along the bottom edge of the ribbon, securing all the triangles to the ribbon. Then stich along the top of the ribbon to close it off. 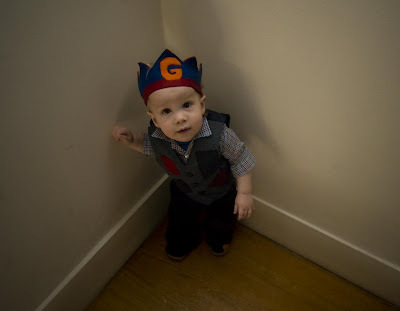 I made two other things for Gram's birthday: a crown and a vest to match his patchwork pants. 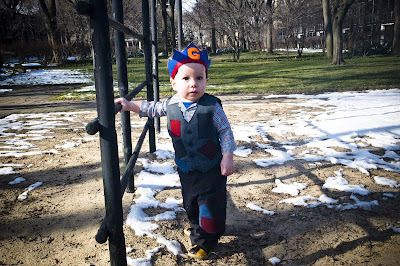 For the vest, I found a really cheap size 4T vest at a thrift store, cut it apart to make it smaller and to sew patches to the front panels, and then I sewed it back together again in Gram's size. It was really easy and took a little over an hour from start to finish (and I am slow). Your banners look great. What fun. 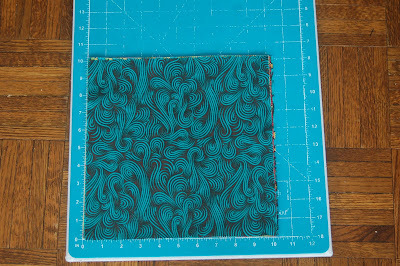 A less ambitious version, without interfacing or finished seams. I just stitched the triangles together and then trimmed the edges with pinking shears. I used binding tape for the "ribbon." I like the pinked edges but if I did it again, I'd use a wide ribbon like yours. Also, I covet your cutting wheel and the measuring mat (or whatever it's really called). On the shopping list for next time. Wood, I'm really enjoying reading about your projects. They turn out so well and you make it seem like even a non-perfectionist like me could make them work.